1 – Brett Harrison (London Jr. Knights) – Harrison put up numbers not seen since Nick Suzuki was in the league. An elite goal scorer with great hockey sense, Harrison helped carry London to the OHL Cup after a 1st round playdown loss and his absence was very noticeable when he missed time. Look for Harrison to be off the board early come Saturday morning. 2 – Maddox Callens (Brantford 99ers) – Callens wasn’t flashy this season, but incredible effective. His shot from the slot was the best in the league and he brought a smarter physical aspect to his game this year. Callens is one of the few Alliance players who should be wearing an OHL uniform in 2019/20. 3 – Deni Goure (Chatham-Kent Cyclones) – The winner of the Alliance Player of the Year, Goure was the straw that stirred the drink that was Chatham’s offense. A big centre who can fly down the ice, Goure was successful despite drawing double teams on most shifts. Goure showed flashes of dominance that may make teams eager to grab him before he’s gone. 4 – Steven Laforme (Brantford 99ers) – Laforme is one of the players who really showed his abilities in the second half of the season, and even more so when Callens was out of action for a few games. Arguably the strongest forward in the loop, Laforme’s puck control and size make him a handful for defenders. He also has an under rated shot and very good skating. Some have told me that Laforme can and will play in the OHL as a 16 year old. I believe them. 5 – Landon McCallum (Brantford 99ers) – McCallum continued to be my favourite player to watch all the way until the final game of the season. Immense talent mixed in with the pest role, McCallum can take over a game with his speed, stick handling and very effective shot. While the theatrics make scare some away, you can’t deny the impact he has on a game. 6 – Ryan Burke (Elgin-Middlesex Chiefs) – If Harrison is the top goal scorer in the league, Burke is 1A. A dangerous player anywhere in the offensive zone, Burke was a major reason for the postseason success of the Chiefs. Not the biggest player, but one with a lightning quick release. A second half riser amongst many lists. 7 – Cole Hipkin (Brantford 99ers) – Hipkin logged a tonne of minutes this season as the 99ers ran just five defense for the entirety of the season. Fatigue may have set in late in the season, but Hipkin still showcased the strong puck control and offensive capabilities we’ve come to associate with him. The top defenseman in the Alliance, Hipkin could be targeted by teams needing a top flight D early in the draft. 8 – Marko Sikic (Kitchener Jr. Rangers) – A smooth centre with one of the best hockey minds I’ve seen at this age in some time, Sikic is another second half performer and a big reason for Kitchener’s success. Not overly physical despite his size, Sikic has a fantastic two way game and reminds me a lot of former Jr. Ranger Cole Schwindt. Sikic has great vision in the offensive zone and will be a leader for any future club he is on. 9 – Cayden Faust (Windsor Jr. Spitfires) – Faust really showed off some vast improvements this season with his skating being the biggest beneficiary. There is no questioning Faust’s offensive capabilities, but his length on defense is what really impressed me throughout the season. Falling under the radar in public opinion, Faust could make a team very happy in the upper-mid rounds. 10 – Ray Hamlin (Windsor Jr. Spitfires) – Aside from Sikic, Hamlin was the best player over the final 3 months of the season, Hamlin is the complete package you want in a centre. Hamlin plays a physical style with great defense and subtle offensive skills. As tough as they came this year, Hamlin is a handful for any defender tasked with stopping him. 11 – Owen Parsons (Waterloo Wolves) – Parsons scored some of the most timely goals for Waterloo this season and that can be attributed to his puck control and incredibly accurate shot. Parsons was a good facilitator but also thrived going one on one against defenders. 12 – Cooper Way (Waterloo Wolves) – While Parsons may have led the Wolves offensively, Way led them everywhere else. A big centre, Way is most effective when he uses his speed and size taking defenders wide. With his size and skill, Way is another Alliance prospect that should see his named called in the 4-6 round territory. 13 – Sam Sedley (Huron-Perth Lakers) – The number two defenseman on the board is another player I feel gets talked about far less than is warranted. Sedley is a big player on the back end with a harsh physical game, but also with some of the smoothest skating and best hands in the league. Teams covet players with his skating ability on defense and when you add in his offensive potential, that’s a good combination. 14 – Jordan D’Intino (London Jr. Knights) – Has been healthy since my last set of rankings and continued to produce at the rate he did before his injury. D’Intino checks all the boxes you look for in a centre. He’s got playmaking ability but can also bury the puck when the opportunity presents itself. Should be a good contributor to an OHL as a 17 year old. 15 – Braeden Bowman (Kitchener Jr. Rangers) – Bowman always has his head on a swivel, looking for that perfect pass. When it isn’t there, he’s got a bullet for a shot whether it’s a quick snap or he winds up from the point. Bowman has the ability to make quick decisions which keeps the defense continually back pedalling. Bowman was a real standout at the OHL Cup for Kitchener as well. 16 – Camden Daigle (Huron-Perth Lakers) – A smaller offensive juggernaut, Daigle started out the year on a torrid goal scoring pace and while he didn’t keep that pace up, he continued to be the Lakers top threat. Accuracy is the name of his game and should he shore up his play on the defensive side, Daigle has the potential to make a strong impact at the next level. 17 – Kai Greaves (Cambridge Hawks) – Greaves was the guy on the blue line for the Hawks this season. A big defender with a wicked shot from the point, Greaves worked his way into the conversation with the likes of Sedley and Hipkin as being in the top tier of D in the Alliance. While turnovers were a problem down the stretch, teams will see the year over year improvement in his game and make that call. 18 – Brayden Hislop (Waterloo Wolves) – Another offensive minded defense, Hislop almost became a fourth forward on the ice for the Wolves when they were in need of a goal. Hislop’s footwork allowed him to cut quickly when rushing the puck up the ice and he wasn’t afraid to bring it behind the opponents net and let the forwards set up. With that style comes an increase in turnovers, which will need to be monitored at the next level as those guys won’t let you get away with them. 19 – Mateo Amaral (Cambridge Hawks) – Amaral went from an honourable mention type player to a solid top 25 option in my rankings thanks to his ability to control the ice when he was out there. His offensive credentials aside, Amaral has speed for days and threw some of the biggest hits I saw this season. Playing with a chip on his shoulder, Amaral will have to remember to rein it in when necessary but he is a sneaky pick with a nice ceiling. 20 – Max Donoso (Windsor Jr. Spitfires) – Every year I include at least one netminder in my final top 25 and this year the honour goes to Donoso. The Windsor netminder was arguably the top goalie in the loop at the beginning of the season, but it was his play throughout year that solidified that title. His speed cross crease is one of his biggest attributes, but I found his rebound control to be fantastic for his age. Playing a vast majority of games this year, an OHL Cup performance against York-Simcoe opened many eyes to his potential. 21 – Nicholas Beneteau (Windsor Jr. Spitfires) – When you talk about an all around player, Beneteau is that guy. He will do anything that is asked of him and do it effectively. His biggest strength is in the defensive zone and on the penalty kill, but he has some offensive capabilities and has the size to wear the opponent down physically. Beneteau may not put up overwhelming stat totals, but his play in his own end and away from the puck brings value to this forward. 22 – Cole Melady (Huron-Perth Lakers) – Speedy forward with a knack for finding the loose puck, Melady was expected to be the go-to offensive option for the Lakers heading into the season. While Daigle will be remembered for the goal scoring, Melady’s IQ in the offensive zone led to quick, accurate decisions. 23 – Luc Brzustowski (Kitchener Jr. Rangers) – A defensive minded player when the season began, Brzustowski showed more and more offensive flare as the season progressed. Safe in his own zone with a great point shot, Bruztowski proved that he is a valuable player in all game situations. 24 – Jonah Cochrane (Brantford 99ers) – Alongside Cole Hipkin, Cochrane was one of the other 99ers defensemen who logged heavy minutes in big situations this season. Steady in his own end, Cochrane could be counted on to settle the play down when needed or effectively clear the zone when pressure mounted. 25 – Ethan Mathews (Lambton Jr. Sting) – Maybe flying under the radar because of the performance of the Jr. Sting, Mathews is a player who could surprise at the next level. Competent at both ends of the ice, Mathews played like the new breed of D, quick acceleration with the ability to set up play in the offensive zone from either the blue line or behind the net. HM – Josh Cyrenne (Sun County Panthers) – Big, powerful defense with a wicked shot, Cyrenne’s size alone should prove to be enticing from some clubs. HM – Alex Cunningham (Windsor Jr. Spitfires) – On a Windsor team loaded up front, Cunningham always seemed to be a name mentioned when a timely goal was needed. HM – Kyle Maloney (Waterloo Wolves) – Injuries slowed him down at the end of the season, but Maloney’s creativity opens up the ice for everyone around him. HM – Riley Wood (London Jr. Knights) – Showed flashes of the potential he has, Wood could be a great snag if he can consistently put it together. HM – Matthew Sop (Kitchener Jr. Rangers) – Some of the slickest hands in the league, Sop was never afraid to try something new in any game situation. 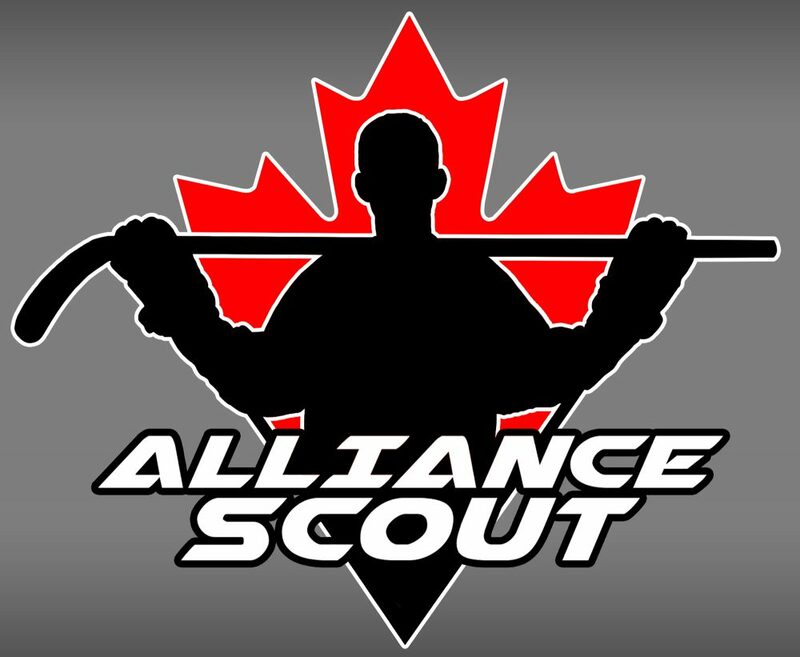 Alliance Scout will have full coverage of the 2019 OHL Priority Selection on Saturday April 6th beginning at 9am. Check back in to the site for a full day of picks and analysis. This entry was posted in Uncategorized by Dave Coulson. Bookmark the permalink.